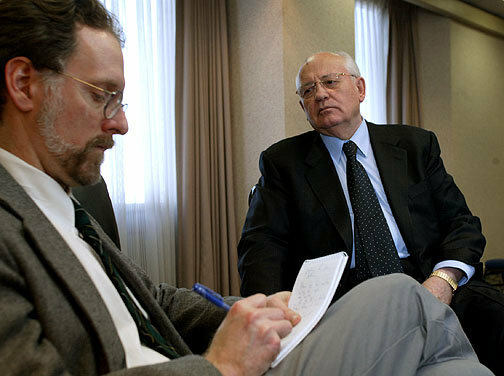 Yes, I was nervous when I interviewed Mikhail Gorbachev. The resulting discussion thread was interesting and uplifting: lots of excellent journalists confessing to their own nerves and discussing how they gained the confidence (and the skill) to overcome the nerves and/or to interview effectively in spite of them. I’ve asked their permission to share some of their advice on my blog. I posted that advice separately. I’d welcome your advice, too, either in a comment on this blog or by email (tell me what you’re doing now and please send a photo you have rights to): stephenbuttry (at) gmail (dot) com. Today’s installment will be my advice on interviewing (not just nerves, but techniques, too). Here I’m updating and reposting the handout from a workshop on interviews that I haven’t led in years. But it was a popular choice back in my writing-coach days. I posted it more than a decade ago on the No Train, No Gain website, but I’ve updated it a bit (the Word doc I had it on was dated 2003). In my response to the discussion thread, I suggested that effective preparation would help the student struggling with nerves. Select the right person to interview. Early in your research on a story, you might need to talk to someone who can give you general background. Later, you might seek someone with a particular experience or viewpoint to fill your last hole or two. Use all the resources you can to find and connect with the right characters: Web searches, LinkedIn or Facebook groups in the community or topic you’re covering, Profnet, directories, colleagues, your organization’s archives, other sources. In particularly sensitive stories, a mutually trusted third party might help you connect with someone. Research before you interview. Learn as much as you can about the character and the topic before your interview. Understanding the character and the issues will help you ask good questions and ask questions intelligently and sensitively. Be honest about what you don’t know. You’re talking to this person because you don’t know everything. If you fake knowledge, you probably won’t fool your character, and you will deprive yourself of a chance to learn from him. A confession here: My lack of research on Crystal Gayle led me to conduct perhaps the worst interview in the history of journalism in 1975 (I think it was), when she was the singing star at the Sidney, Iowa, Rodeo, and I was an intern at the Evening Sentinel in Shenandoah. I had glanced at a press release and knew she was Loretta Lynn’s sister and a new country star, but I hadn’t listened to any songs and didn’t know her well enough to ask good questions. She was the shy one (maybe I was nervous, too, not before the interview, but as it was failing on me). All my questions got answers like “yes,” “no,” “maybe,” and “sometimes.” I literally came away without a sentence I could quote. She seemed personable but shy, and I hadn’t done enough research to ask knowledgeable questions that would prod her to talk. Conduct other interviews. Talk to other people who know the character. If you’re writing a profile, most of your information should come from people other than the main character. You might interview the main character first (so learning of the other interviews doesn’t spook him or her), but save the big interview for later, or at least plan a follow-up interview. Plan your questions. An actual scripted list of questions is stilted. But you might benefit from rehearsing some questions in your head or even aloud in the car on your way to the interview. Consider in advance what follow-up questions you might ask, depending on how the character answers a question. It’s a good idea to have a checklist of topics you want to ask about. Don’t be a slave to the list during the interview, but glance at it toward the end, or if you freeze during the interview, to see if you’ve overlooked something important. Use the elements of story as a checklist in planning your questions: What questions will help me understand the conflict or the character’s motivation? Write what you can before the interview. If you write as you report, you will generate important, specific questions for later interviews. Your stronger sense of where your story is going will give a strong focus to subsequent interviews. Honesty. Tell the subject up front, when you arrange the interview and again when the interview starts, what you are working on. This doesn’t mean you ask the tough questions first. But you tell the subject honestly what the story is about and what you will be asking about, so the tough questions don’t feel like an ambush. Complaints. The person may have some gripes about how you personally, your publication, or the media in general have covered something in the past. Listen to the complaints. Don’t feel an obligation to respond specifically. If you do, don’t respond defensively or argumentatively. Don’t apologize if you’re not sorry or if you were not responsible. The best way to handle most complaints is simply to listen and acknowledge, with brief explanations offered sparingly where appropriate or asked for. Personal connection. Seek ways to establish a personal connection. Do you have a child the same age as one in the picture on the desk? Ask about the character’s children and commiserate briefly about car seats or car pools or car insurance, whatever stage the children are. Is the diploma on the wall from your school? Chat briefly about professors you might have shared or the school’s athletic teams. Don’t fake a connection or stretch for one, but be alert for genuine ways to connect. If you have little in common, connect by showing genuine interest in the character beyond the narrow focus of your story. Control. Unless your character is used to being interviewed, she probably feels uncomfortable facing you and your notebook and/or recording equipment (more nervous than you, however nervous you are). Early in the interview and again toward the end, give her some control. Sure, you’re asking the questions, but answer hers if she asks any. Listen politely as she wanders off the subject occasionally. People don’t talk like we write. They might bury the lead (well, maybe they do talk like we write). Give the character time to get around to it. Before you wrap up the interview, ask if she would like to add anything. In between, you will control the interview with some direct, tough questions. But if you share the control, your subject might feel comfortable enough to give you better answers. And the more control you give the character, the more likely she will take you to a better story you didn’t know enough to ask about. Get the name right. Ask the character to spell her name for you, however common the spelling (if it seems like a stupid question, make a self-deprecating joke or a reassuring comment about your dedication to accuracy). Write the name clearly in your notebook as spelled, then read it back to the character as you’ve written it. Or ask the character to write her name in the notebook for you. Then read it back to her to make sure you can read her handwriting. Then ask for a business card, if the character is likely to have one. In addition to ensuring accuracy, this redundant exercise underscores to the character that she’s talking for the record and that you’re taking notes of what she says and planning to publish her name. Get contact information. Either after you get the name or at the end of the interview, ask the source for contact information: home, work and cell phone numbers and e-mail address, social media. Repeat these back to the character to make sure your notes are accurate. Ask how she prefers to be contacted: email, phone, text, Facebook message, etc. Tell me about … Start with broad open-ended questions or simply invitations to talk. “Tell me about that.” “What was that like?” “Fill me in on . . .” These questions invite the character to tell his story. They also give him a chance to tell something you might not know enough to ask about specifically. And the general nature of the question gives the character a feeling of control as he answers. First things first. Save your toughest questions until near the end. This gives you a chance to develop some rapport before the tough questions. It lets you be sure of gathering the easy information if the tough questions prompt the character to cut off the interview. Remember the elements of story. Observe, take notes and ask questions about the setting. A photograph or award or piece of art may lead the subject to an interesting anecdote or revelation. Ask the character to demonstrate how she did something or show you where something happened or recall specific dialogue. Ask for documentation. Be careful not to ask in a challenging way (unless you are indeed challenging). Ask in a curious way. Letters or a journal may reveal some deeper emotion than your interview brought out at a more detached date. Legal or financial documents may provide exact dates or amounts where the character was estimating or inaccurate in the interview. Photo albums may help you describe a scene or a character. A police report may provide detail that a crime victim may not want to talk about. A resumé may provide details that a modest character might not disclose without prompting. Learn what the character’s “Walmart sack” is and get her to trust you with it. Shut up and listen. Don’t feel the need to fill the long, awkward pause. It’s a natural urge, and the subject is feeling the same thing. The pause may draw out the answer your question didn’t. You want thoughtful answers, so give the character time to think. This is not a stubborn staredown. You casually take a few moments to catch up on your notes, to take a few notes about the setting or your subject’s appearance and mannerisms. Just shut up and listen. Listen for the surprise. Listen for the surprise in the interview: the offhand remark that contradicts what you (or your editors) thought you knew; the iceberg tip that’s an invitation for you to extract a Poe-like confession; the hint at a much better story; the secondary interest that might lead you to a completely unrelated story. Don’t write everything down. You are not a court reporter, trying to transcribe every bit of an interview or event. You’re a reporter, seeking to capture the important and interesting essence of the interview or event. Start making your judgments about what’s interesting or important as you take notes. Don’t waste energy or paper (or lose the chance for eye contact) by taking detailed notes on things that you know aren’t important or interesting enough for the story. Distinguish between information and quotes. When you’re gathering information, you must get numbers, names and spellings correct. But the speaker’s exact words aren’t important, because information-bearing quotes usually aren’t strong quotes. Concentrate on getting the facts correct, rather than the words with which the speaker delivered them. Concentrate on the strong quotes. When someone says something that conveys strong emotion or opinion, or when you hear revealing dialogue, take verbatim notes. Echo the speaker in your mind as you write, committing the statement(s) to memory, so your memory will have the words as your hand catches up. Slow the speaker down. If the speaker is giving information, slow her down by asking for details or sources. How do you know that? Are you sure? How’s that spelled? Is that an approximation or the exact amount? Do you have some documentation? Repeat. Maybe the character said something important, but it followed a powerful quote you were still scribbling down and you’re not sure you got the second quote. Repeat it back to the character: “Let me make sure I understand this correctly. Did you say …?” This gives you confirmation of the information and buys you time to take the notes. And maybe he will elaborate or say it stronger. Ask throwaway questions. When you start falling behind, ask a “throwaway” question about general background that you already have or personal information you don’t care much about. This gives you a chance to catch up on your notes before you forget the important or interesting things the character just said. Take notes on senses. Don’t just write what you hear. Note what you see and smell, even what you feel and taste if those senses help tell the story. Note the emotions. If the character raises his voice or starts to laugh or cry, write briefly what prompted the emotion and how the character reacted. Journalists are divided on how important recording is, but the need for video and audio content for digital platforms is making it essential to record at least part of most interviews that are on the record. Early in my career, I sided with journalists who preferred not to tape. Too often recorders result in sloppy note-taking, untimely disasters and lots of time wasted listening to and transcribing recordings. But I thought you should use a recorder now and then to test the accuracy of your note-taking. If you aren’t getting important information or quotes accurately, then you absolutely should record. Interviews that you know could be contentious. Recording might head off claims that you misquoted the character or resolve disputes about what the character said or what you asked. An interview with a character you know to be a fast talker. When lengthy dialogue or a Q & A format will be important. Few reporters can take accurate verbatim notes that long. If you are inexperienced at taking notes and know your notes are not very good, a recorder can help while you are gaining experience. Take notes as if you weren’t recording, because sometime the equipment will fail, or the background noise will drown out the character, and always at the worst possible time. Make sure you have fully charged equipment and plenty of room for the data you will be recording. Choose a quiet setting. Background noise in a restaurant or at a ballgame or political rally will drown out the quote you want. Ask if the character minds you recording. Sometimes recording makes a character uneasy. Say that the recording helps ensure your accuracy. Be willing to settle for just your notes, if that’s what it takes to get the interview. Adjust your approach to the character’s comfort level. You might start the interview with just a notebook or a notebook and audio recording on your smartphone. Then toward the end of the interview, you start shooting video to ask (or re-ask) a couple key questions. Each approach has its advantages. Recording a full interview gives you every word (if it’s audible) to use in audio or video, if you need it. But starting out without recording (or shooting video) might make the subject more comfortable, and it lightens your digital editing load to record just a few key questions. Check the time on your recording equipment now and then, writing it in your notebook. Be sure to write down the time especially after a key quote that you might want to use. That way you can find quotes quickly. If you’re working with a visual journalist who’s shooting photos and videos, confer in advance on when you shoot video, so you each understand the other’s plans (but respect your colleague’s decision to adjust plans as the interview unfolds). It still may be a good idea, depending on the character’s comfort level, to record audio of the whole interview. Listen to yourself on the recording. That will help you, as I said earlier, stop asking the filibuster-type question. And it will help you identify verbal habits such as overuse of “you know” and “like.” Not that you’ll ever eliminate all clutter. That’s part of conversation, and being too formal in an interview can be as harmful as too much stammering. But listening to yourself will help you get to the point and interview more smoothly. Label your audio and video files for easy searching and archiving. Telephone. Learn where the source is (both physically and in terms of context, such as home, work, traveling or with other people nearby). Make sure to capture the number (if he called you), so you can call back for follow-up questions. Telephone is better for follow-up interviews with someone you know than a first interview. When someone is on a roll, an occasional “Uh-huh” or “What happened next?” is helpful to confirm that you’re listening. You don’t have eye contact or a nod of the head to confirm engagement, so give a slight vocal response now and then, even when you want the person to continue talking. Video interviews. Platforms such as Skype, Hangout and Face Time are preferable to phone interviews, if they work for your source. You can have them move a laptop, tablet or phone around to show you the office or home. You can ask questions about the setting. You can nod your head, even if eye contact is difficult. Use YouTube (with Hangout) or a screen-capture video program, so you can record the call for accuracy and possibly for a brief talking-head clip. Whatever device(s) you use, sometimes audio won’t be perfect. Ask the person to repeat an answer or even a word if you didn’t hear clearly. The character will appreciate your commitment to accuracy. Everyone wants to be quoted correctly. Speak up clearly yourself and be ready to repeat a question if necessary. Email. You can’t describe setting or maintain eye contact in an email interview. But you know you’re quoting correctly. And sometimes you can get a quick reply. Email can be a great way to follow up a face-to-face interview. I had a story once where a key source lived in another state and was hearing-impaired. She preferred communicating by email, so I interviewed her at length through an exchange that might have been dozens of emails. Not only did she provide me lots of important technical information, but she showed some personality in her emails. Social media. If you know who someone is and know that they prefer to use social media to communicate, direct messages on Twitter or Facebook might use. Because I am known for my Twitter use, a Baton Rouge reporter interviewed me publicly on Twitter shortly after I started at LSU. Excited to do a #TellDIG interview with @ManshipSchool social media expert @stevebuttry over the next few days – on Twitter! Stay tuned. A caution about distant interviews: Be sure you really know who’s talking to you (or be candid that you don’t). I could only interview @blippoblappo and @crushingbort by email, because they were not disclosing their identities, so I had to be clear about that. I was sure I was communicating with them, though. They were just a couple of guys with a blog, not public figures who might have a press secretary. If you’re emailing to a politician, you might actually be communicating with a spokesperson. If you’re communicating with by social media with someone who’s not a public figure, maybe some third parties can verify someone’s identity for you. One more time. Re-interview when possible, with a follow-up phone call, a second face-to-face interview or just an e-mail. You’ll think of a few more questions, but your character may also have thought of a few more answers. Sometimes you get the better interview the second time around because your questions the first time provoked a few days of thinking, bringing back some old memories and sending someone to the telephone or the scrapbook for answers you didn’t get the first time. Or maybe you ask better questions the second time, because you’ve been thinking, learning or writing since the first interview. Write right away. Write as soon as possible after the interview. It’s best to write the story itself right away, even though you may be far from finished with the reporting. If you know the interview will provide only a few paragraphs for the final story, write those paragraphs. At least go through your notes and write, in paragraph form, what you might use in the story, including your notes on mannerisms, setting, emotions. Check facts. Any time you have a doubt about a fact or quote, check back with the source to nail it down. Some journalists preview all or parts of a story with sources before publication to check for accuracy. Make sure your editors agree with that approach before you do it, and be clear to the source that you’re only checking facts, not giving the person the right to dictate how you will tell the story. Seek documentation. Gather documents from police, courts, Internet, etc. to support, contradict or expand on what the character told you. The documentation may provide questions for a follow-up interview. Cultivate a genuine interest in the person you’re interviewing, too. That makes everything easier–and more fun!